Between major algorithms like Panda and Penguin, and just plain old everyday Google algorithmic changes, it can sometimes be hard for to figure out why your site isn’t ranking in Google as highly as you would like. 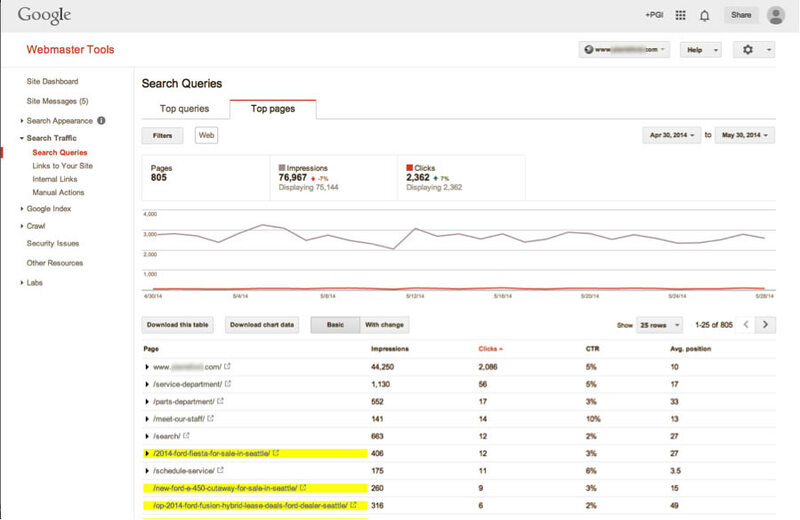 With recent changes to Google Analytics, you can no longer see your keyword search terms. Google Webmaster Tools has everything you need to know on how your website’s search results are performing in Google. Having more unique pages on your website will increase the amount of keyword terms you will show up for in search results. In Google Webmaster Tools you can clearly see the benefit of having extra SEO focused content on your website. In the example this dealer has dozens of its top performing searched pages are from Content Motive.